Do you need more greyhound in your life? If the idea of a sweet, affectionate 'couch potato' of a dog sharing your home sounds greyt then the answer might be greyhound adoption. Do you want to hear something INCREDIBLE? Since our investigations exposed widespread live baiting cruelty in the greyhound racing industry, caring Australians have responded by opening up not only their hearts but their homes to these sweet-natured animals. 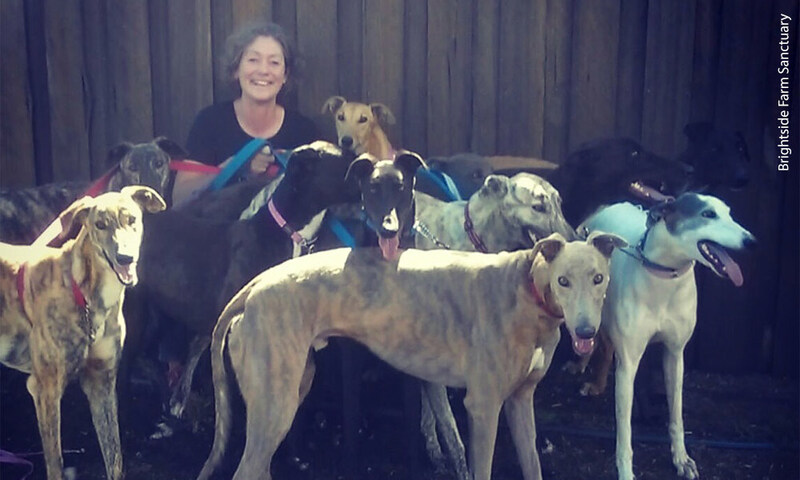 Greyhound adoptions across the country have increased, with one NSW rehoming body saying that they've DOUBLED! Whilst more of these discarded dogs are finding a second chance at life in loving homes than ever before through greyhound rescue, sadly, there are still thousands of dogs that don't get this chance. Greyhounds Australasia admitted that up to 17,000 healthy dogs and puppies are killed every year because of greyhound racing. This equates to an astonishing 96% of all pups born into the industry being killed by their fourth birthday. You can help give a greyhound the chance to be the companion they were born to be by adopting or fostering one through a greyhound rescue group. Is greyhound adoption for you? Many people are surprised to discover that greyhounds make wonderful family pets. They're naturally gentle and loving dogs, who generally don't require a big backyard or a huge amount of exercise. In fact they make great apartment dogs — they haven't earned the nickname '60kph couch potato' for nothing! Most greyhounds are content with a daily walk and plenty of cuddles. Right now there are greyhounds around the country waiting patiently for their forever homes. By adopting a rescued greyhound you'll be saving the life of one of these amazing dogs — and gain an unforgettable family member. If you're not able to make the lifelong commitment of adopting a greyhound, don't worry! You can still get all the perks of sharing your home with one AND save a life — by becoming a temporary foster carer for greyhound rescue. Greyhound rescue groups across the country are always on the lookout for committed, reliable foster carers who can help dogs make the transition from kennel to couch. Fostering is a crucial part of the greyhound adoption process, as foster carers can help dogs become familiar with living in a home environment and ensure they go to the perfect forever family when adopted. Every Greyhound is an online directory listing greyhounds for adoption in each state. The RSPCA has provided a great e-booklet about greyhound adoption which you can download here.